My adventure out west to race 24 hour mountain bike nationals led to a 7th place finish and lots of lessons learned for next year’s Race Across America. Here is all my heartrate data and a map annotating the course as well as a general description of the course. The lap times on my heartrate graph do not include time spent resting between laps, so this gives a better picture of how my legs/body were feeling on any given lap than the official lap times which include time spent in the pit between laps. One of the things I was really happy with for this race is that after an hour and a half of sleep, I put in negative splits on my last four laps. In other words, each of my last four laps was faster than the one before. That is very encouraging for RAAM how my body was able to recover and respond after such a short rest. Annotated topocreator map of the entire course. 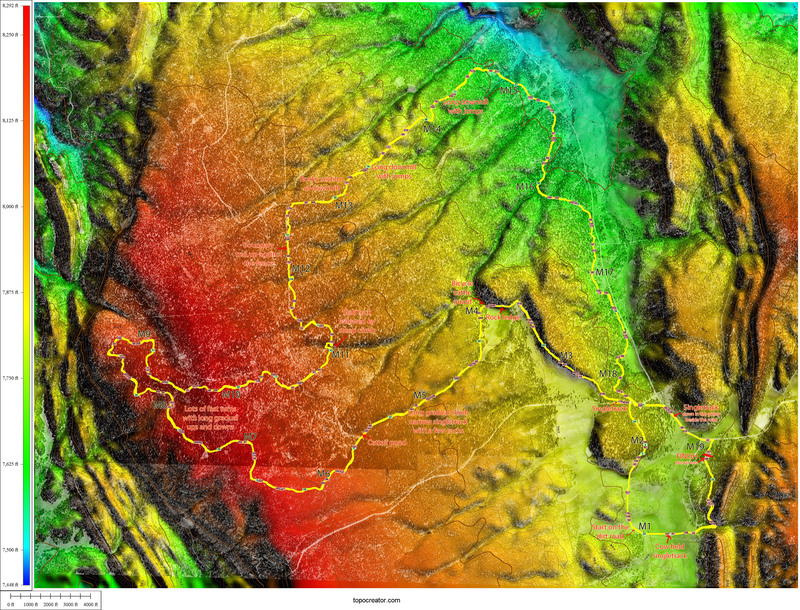 One of the advantages of the topocreator map over Google terrain view is that it is very easy to pick out the high points on a course like this with all its gentle sloping. Click to enlarge. Or you may also download a high resolution version of this map. We started the race out on the wide dirt road so that we would have a chance to sort out positions before the start of the singletrack. I had been worried all week that we would start in the campground under the finishing banner, which would mean a very short dash of 100 meters or so to the start of the singletrack before the dirt road. This singletrack was a climb through the campground followed by a descent to a bridge with a 90 degree turn entering and exiting the bridge – then more descending down through a cow field before a gentle climb up to the dirt road. When they announced during our pre-race meeting that the start would be on the dirt road, this was a huge relief that I wouldn’t be pressured to going really fast through the opening singletrack. The thunderstorm I circumnavigated on the race course without a drop of rain! Opening singletrack through the cow field … storm approaching on Friday’s ride. Still, it is tough to get everything organized for a 24 hour race and I didn’t hop onto my bike to ride over to the start at 11AM until after 10:30AM. Jake Wade (friend from ultracx racing) and I rode over past the start together and then out to the start of the singletrack and back as warmup. Even though we were back at the start by 10:45, there was already a ton of people lined up. So I started in the third or fourth row thinking that it was going to be tough to make up much ground before the start of the singletrack. Fortunately, I was on the righthand side and there was a 30+mph crosswind blowing from the left. I passed a ton of people and settled into line somewhere in the top 10 before the start of the singletrack. The opening singletrack dropped down briefly before climbing steeply for about a quarter mile. Then it rolled along the side of a hill eventually making a 90 degree turn to head back down into the valley. But before hitting the valley, the trail went straight up a rock ledge. This was totally rideable as long as you had some momentum. I was worried that if you weren’t far enough forward somebody would goof this up and everybody behind would have to walk. I’m not sure if that happened or not because I was far enough forward that everybody could ride it. Dropping off the ledge on the other side was a dip down to a bicycle-specific cattle guard to take you into the long climb to the top of the course. Arrived after 1400 miles of driving and went straight to do a lap starting at sunset. The cow was rubbing its face up against the course marker as I rode by. Collage of pics from my first ride on the course after arriving on Wednesday. This climb started out very steeply but then rolled a bit before settling into a gradual gradient for several miles. The gradual climb was easy and non-technical except you did have to pick your line carefully to avoid riding over some big rocks. Those rocks were also rideable, but for a 24 hour race you are looking to save every ounce of energy and save your body from as many rock-jolts as possible … so you wanted to ride around those rocks instead of over them. The climb was about half-way over by the time you made it to the cat-tail pond where the junior course split off to the right. Cat tails on the trail! The cattail pond between mile 5 and 6. After the pond, the course continued to climb through miles 6 and 7. Topping out for the first time shortly after mile 7, there was a gentle fast downhill with lots of sandy turns before a gradual climb up through mile 8. This process repeated itself several times through the rim trail until you finally made it to mile marker 10 which was the high point on the course and the start of a long gradual descent peppered with a short steep climb at mile 11 and a few other small rollers. The climb at mile 11 started out with a short rock slab section followed by a turn straight up a steep hill. I rode it every lap except lap 8 where I was so exhausted I walked the whole section (including the flat parts) just to change up the pace a bit and give my hands a rest from gripping the handlebars. One of my favorite parts of the course was shortly after this short steep climb – the singletrack continued climbing for a bit before diving back down one more time into a gulley followed by another steep climb on the other side. I figured out in my pre-rides that even with the rocks and roots on the climb, your best bet for this was to fly down the hill and hit the gulley at full speed. You popped up over the rocks and were more than halfway out of the gulley before you even had to pedal. Almost immediately after this, you rode straight towards a property line fence. The singletrack followed the fence very closely for about a mile. Each lap I looked forward to this fence because it meant you had about a mile of easy, smooth, fun riding before the rocky section of the downhill and then the long “berma” section of downhill. I didn’t get any pictures of this part of the course in any of my pre-rides because I never wanted to stop to take one. Sweet jump at mile 14, just watch the sharp turn afterwards! The first major jump on the downhill section came right before mile 14 (red mileage marker visible in the middle of this picture) and was followed immediately by a 90 degree turn. Early on when you were fresh you had to make sure to keep your speed under control so that you didn’t endo on the landing. The strava segment for this long downhill is called “Berma” presumably because after the jumps you have a number of partially banked turns. The dirt was quite loose so you had to get your line right or risk having your wheel washout. I had a couple close calls during my pre-rides, but by race day had nailed it down pretty good. Once you hit the bottom of Berma, you basically had a 4 mile rolling climb to the finish. The rollers were pretty steep (both up and down) so you got to do a lot of resting on the downhill parts which made the uphill sections more manageable after you had been racing for a long time. The finishing stretch back into the campground. I keep thinking of Rio … "ciobala, ciobala" shake your…"
The last mile was some narrow, bumpy singletrack alongside a beautifully paved road. No paved road for the race course, however, with 18 miles of single track and just over a mile of dirt road for a grand total of 19.15 miles per lap. In this picture the righthand side is looking up towards the campground / finishing area and the left side is looking back down the final mile of singletrack alongside the paved road. That takes you through a single lap of the course. I was fortunate to pre-ride the course four times during the week leading up to the race and then twelve times during the race for a grand total of approximately 325 miles of singletrack — easily surpassing any kind of all-time personal record of number of miles of singletrack ridden in a single week. The course was perfect for a 24 hour mtb race, fast, diverse, safe, fun, and challenging. I’m very sad that USA Cycling is dropping this event off the national championship calendar, but the event was so well run we are definitely going to have to make this a future family vacation sometime in the next few years … maybe even next year! This entry was posted in Adventure, Racing and tagged data, topocreator on June 28, 2014 by kartoone.